True performance of Microsoft Outlook in a user environment is key as we spend hours a day with it. To get that performance you need cached mode of Outlook to be enabled or work with a on-premises Exchange server. This is a local cache which is held in the user profile. It is used to speed up searching mail. Switching it on isn’t all that simple, depending on the environment you work in you don’t have to ability to switch it on, until now with FSLogix. The problem is that most of the time these days employees work in a non-persistent environment, a Citrix XenApp environment or a non-persistent Citrix XenDesktop environment. The cache of Microsoft Outlook would be destroyed on logoff and had to be recreated at logon. A non-workable solution as that would not provide for speed but for slowness as the user would have to wait for the cache to be created. FSLogix now is offering a solution that allows you to use your current profiling solution and drop-in a new solution that allow you to enable to use cached mode in a non-persistent Citrix environment. They call it FSLogix Office 365 Containers or Project Flux. FSLogix has seen this same issue and came up with Office 365 containers for Citrix environment. You all know FSLogix from the Profile containers they used to have. What they noticed is that companies often told them “we already have something similar”. So the couldn’t close the deal due to RES, VMware UEM or AppSense already running. what they did now is that they created a product that is a drop-in for a specific problem, a huge problem for sure. Regardless of the UEM solution you have already, this Office 365 Containers will fit and solve the cache mode and Windows search issues in your environment. I think it’s cool that they create it like this because it is an issue and it was hard to talk to customers about adding another solution. This might be a good deal and the price, I heard $10 per user per year won’t be the deal breaker. So what are they offering? With using the new offering from FSLogix the OneDrive Cache can persist between sessions in a Citrix XenApp or XenDesktop non-persistent session, this is good for user experience. This was possible in their other product, profile containers but than you had a complete solution that would interfere with the other UEM solution. 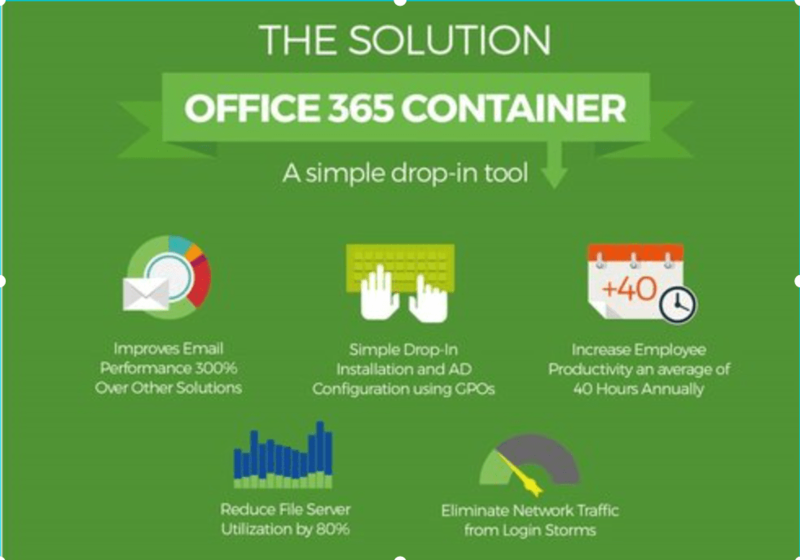 now with Office 365 containers you have a drop-in to solve this. Also the Skype for business GAL will be available between sessions with the new offering from FSLogix. I haven’t ran into this one before but I can imagine that this GAL could be pretty big to copy in a profile solution. Something you always hear in projects, what to do with the Windows search. From a user perspective you want to enable it but from a performance perspective you want it off. Now there is a way to leave it on in a non-persistent environment and gain happy users with a search history in a non-persistent environment. As said before the way they designed this is that instead of the profile containers which were seen as a replacement of the current UEM solution this is a plug and play solution. A quick installation of the agent and you can drop the solution to work with your current UEM solution. FSLogix thought about this and I think they might have opened a market for themselves not being the competitor anymore but being the add-on. Will it only work with Office 365? Will it only work with Citrix? What I understand now is that it is not limited to Office 365, it will make cached mode possible that’s it. The issue is the biggest with Office 365 so that why that is emphasised. Also it will work with VMware or any other solution, there is no specific reason that it would only work with Citrix, I think Synergy might be a reason it is called like this right now. I’m not sure ask them, they are at the floor at booth 729E. About how it is working, they work with an agent and a VHDX file where the files are stored. So the agent takes care that the VHDX file is connected and that the files are available on time. This is a short version of the working, I don’t have the time right now to do a good test so that is something I need to schedule for later. To just a a few screenshots of a GPO won’t do to show how it works, you need a video that shows the speed. If you are not at Citrix Synergy but still interested in this solution, visit their site for more info – link -. Hope this article gave you some insight in this solution, it solves something that is real, we are pushing services away from the user and pushing mail away has not been the best choice so far. With FSLogix Office 365 containers a solution that you can add to your current UEM solution is here. Have fun at Synergy.